Let’s assume that the Sun is a point source of radiant energy, which radiates a total power of about 4 x 1026 W into space. This energy is smeared out over a surface area of a sphere 150million km in radius. On an annual basis, this energy reaching the Earth surface is 3.2 million EJ/y, which is close to 7000 times global energy consumption. If we could harvest even a small fraction of this energy we could solve all our energy problems. Global energy consumption last year was 0.0015% of emitted solar radiation reaching the Earth’s surface and projected global consumption in 2100 is 0.051%. We should therefore expect that we should have the technology to harvest enough solar energy to replace harmful fossil fuels. It’s no coincidence that the three common magnetic materials, iron, nickel and cobalt are next to each other in the Periodic Table. This suggests that the number and configuration of their electron structure might be responsible for magnetic behaviour. If we stroke the iron using a magnet – like stroking a cat, always in the same direction – the magnet will attract all the opposite poles so that they point in the same direction. The iron becomes a magnet. In this case, we have stroked the iron with a S pole in the anticlockwise direction, so a N pole is formed on the right hand side. Once all the domains have lined up, our iron bar is completely magnetised. It won’t make any difference if we keep on stroking it. Iron is magnetically SOFT – easy to magnetise or demagnetize. Heating or hammering messes up the domain directions and causes a magnet to lose its magnetism. Background radiation is all around us. We can do little to avoid it. Most background radiation comes from natural sources, while most artificial radiation comes from medical examinations and industrial processes. Granite – used for house building – is the major source of radon. In addition, the Earth’s rocks contain a large number of naturally occurring isotopes, such as uranium. 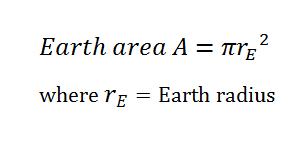 Cosmic radiation from outer space depends on altitude. Flying in an aircraft increases the dose of cosmic rays by a factor of ten. Isotopes which are made artificially in nuclear reactors are used for a variety of medical and industrial purposes. Notice that nuclear weapons account for a tiny fraction of the background dose. Workers in these places must have their radiation dose monitored to avoid over-exposure. For more on detecting radioactivity, go here. For more general information on radioactivity, look here. In 1900, Max Planck introduced the quantum concept. When an object radiates light, it releases a unit of radiation energy called a photon. In 1913 Niels Bohr suggested that electrons travel in circular orbits around the nucleus. The electron possesses a specific energy and it is said to occupy an energy level. If an electron changes orbital in the Bohr planetary model, there is a quantum (fixed jump) energy change. The emission line spectrum results from electrons dropping from higher energy level to lower energy levels. Each time an electron drops, a photon of light is released whose energy corresponds to the difference in energy between the two levels. Einstein and Bohr had a major and highly colourful public disagreement – or perhaps ongoing debate. In the 1920’s principally because of Werner Heisenberg’s groundbreaking work, our understanding of electrons in atoms became very sophisticated. It was proposed that the energy of electrons can be known only in terms of its probability of being located somewhere within the atom. The description gave rise to the the concept of a quantum mechanical atom. So,a location within the atom where there is a high probability of finding an electron having certain energy is called an orbital. For AS, all you need is The Spectrum of Atomic Hydrogen which you have in your notes. This looks odd. 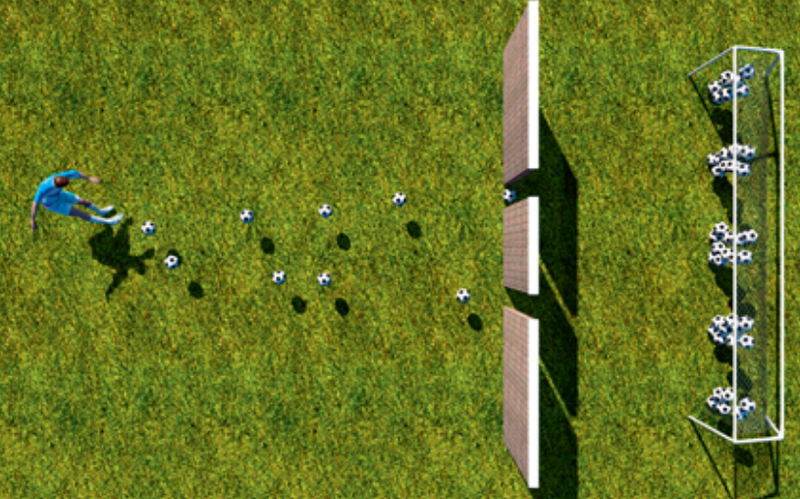 A football player is kicking balls towards a wall with two gaps in it. Notice how the balls pile up in the net as they go through the two gaps. We recall that whenerver a wave passes through an aperture, it diffracts. The narrower the gap, the greater the diffraction. When there are two slits, their diffraction contributions add together. A bright fringe is formed when the contributions superpose constructively, having a path difference of a whole number of wavelengths, a dark fringe when the path difference is an odd number of half wavelengths. 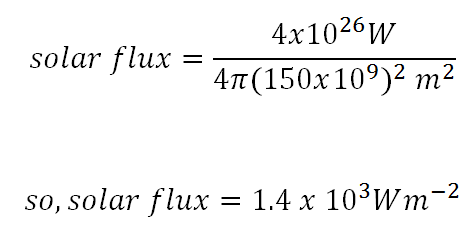 Click on the link for an explanation and the equations. Young’s slit theory. Evidence for light as a wave. Each slit contributes its own diffraction pattern. Where these overlap, interference occurs, or superposition of amplitude. The two slit interference fringes lie underneath the diffraction envelope and where the interference fringes lie underneath the diffraction minima, we don’t see them – so-called “missing orders”. Young’s method can be used to find the wavelength of the incident light – approximately. It’s approximate because we can’t accurately determine the exact centre of a bright fringe. Download the Wolfram CDF player and load up the demonstration “Intensity Distribution for Multiple Slit Diffraction” With 2 slits; it looks like this…You can change all the important parameters – slit width and slit separation.